It is easy to damage your beautiful hardwood floors with bad habits. Keep reading to learn about bad habits that may be causing damage to your floors. Waxes, oils and floor polishes sound like a great idea except for the fact that hardwood floors have a protective coating on them already. When the coating wears down, you will want to consider having the flooring professionally coated. Once a “refresher”, wax, oil, or polish is applied, you may not be able to have the floor professionally coated. Polyurethane will not bond to an acrylic or oil. It is always a good idea to read the fine print on products. Most of time it is right there on the label. 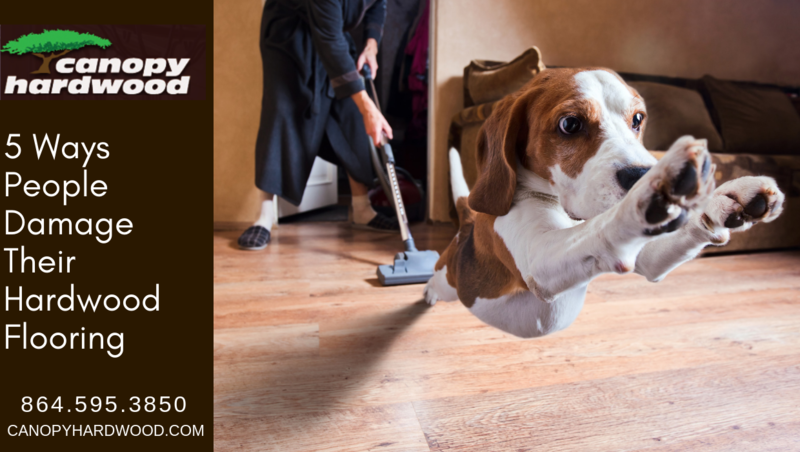 Read more about caring for your hardwood floors. Steam that is blasted on hardwood flooring can ruin it. You will begin to notice tiny fissures in the finish. Then the wood may begin to split. Even though steam cleaners may be advertised for hardwood flooring, flooring manufactures advise against using steam to clean your floors. Did you know that wearing your shoes inside can track dirt and sand inside scuffing up the flooring. Small rocks can get caught in the treads of your sneakers scratching your floor. Also, wearing high heels can cause small dents or dimples on the hardwood flooring. This can be prevented by switching to flat shoes when you get home. You can also help prevent damage to your hardwood floor from your high heels by replacing the rubber heal when it is worn down. Children’s plastic toys may have edges that can damage the hardwood when scooted around. Consider placing a rug or foam mat under the plastic toys to avoid potential damage and to protect your floor. Read more about selecting hardwood floors for children. The most common cause of damage to hardwood is dog toe nails. This is so easily preventable by trimming your furry friends nails. Follow the simple rule of bringing them to the groomer whenever you hear their nails clicking on the floor! Also, if your pet has an accident on the floor, be sure to clean up the urine right away. Discoloration can go deep into the wood from pet urine. Email or call your hardwood flooring expert at (864) 595-3850 to discuss your flooring options.